A themed patrol car is nothing new for Caroline County (VA) Captain Lambert. In 2014, Sheriff Tony Lippa approved for Lambert to mark the car for breast cancer awareness month. This was done as a tribute to her father and best friend, both of whom died after fighting cancer. The Sheriff thought this would be a great way to show support and bring the community together, provided tax payer dollars were not used for the marking of the vehicle. The marking is accomplished by applying vinyl decals to the vehicle. These decals cause no damage and is easy to remove once the project has ended. The Caroline County Sheriff’s Office has participated in the Project Lifesaver Program since 2006. For those who are not familiar with the program, Project Lifesaver (PLS) provides a new level of safety for families living with Autism, Alzheimer’s disease, and related disorders associated with wandering. An electronic transmitter is placed on the program participant’s ankle or wrist. Should the participant wander, the Sheriff’s Office responds and uses a specially equipped receiver to locate the individual and return them home safely. Since Sheriff Lippa was not able to secure any county funding for PLS, he turned to the community, who responded. The program was initiated on donations alone and continues to be primarily donation funded. Up until recently, families did not have to pay to participate in the program. As Caroline has grown, demand recently outpaced donations. Twice, the Howard Brother’s Paving Company has saved our entire PLS program by generously providing funds that enabled us to continue our efforts. “It is my goal to increase awareness and understanding, so that we can raise enough funds to keep the program running. I also hope to recruit more families to join the program and help keep them safe. 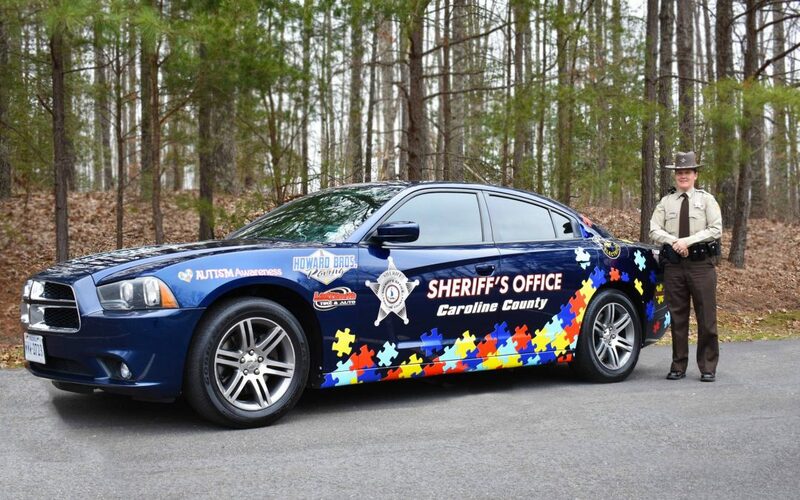 I appreciate Captain Lambert for her idea of decaling another police car for a good cause,” Sheriff Lippa stated. National Autism Awareness month is a great time to donate to our Project Lifesaver fund! Autism impacts every member of the affected family. Donations will be accepted wherever the car is displayed, and also via mail. Please help us to make our Project Lifesaver program a continued blessing to many more families in our community who need your support. 100% of all donations will go towards PLS equipment and supplies. We would like to sincerely thank our generous business partners Anytime Towing & Recovery, Hazzard Electrical, Howard Brothers Paving Company, and Ladysmith Tire & Auto along with our sponsors, Eastern Star Caroline Chapter 174, Illusions Wraps of Fredericksburg, Radley Chevrolet, Radio Communications of Virginia, Roma’s of Bowling Green, and Village Self Storage.